Designed exclusively for California, GAF's new affordable cool roof shingles reflect sunlight to help keep your attic, home, and buildingcooler. Made with a new innovative granule technology, GAF Timberline HD® Reflector Shingles lock in rich, vivid colors never before seen in a cool roof. 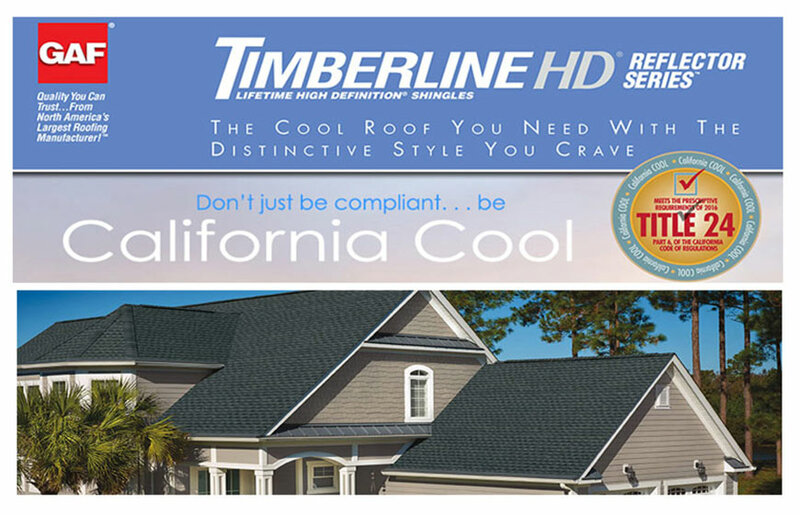 Don't just be compliant, Be California Cool! . . . With Timberline HD® Reflector Series Shingles, you get proven performance and reliability as well as beauty - plus potential cooling cost savings. ►Meets the solar reflectance and thermal emittance requirement to comply with California's Title 24 Standards. ►Rated by the Cool Roof Rating Council (CRRC). The Darkest "Cool" Shingle You Can Buy! Before now, if you wanted a highly reflective roof that meet the cool roof requirements of Title 24, you would have to settle for shingle colors that were lighter and much less vibrant than those available for traditional shingles. Now, innovative granule technology has changed everything! New EcoDark granules produce vibrant colors never before seen in a cool roof. You can finally have the rich, vibrant colors you've always wanted in a highly reflective shingle, including Charcoal, the darkest cool color available. What could possibly be cooler? Shingle colors available for installation in the San Francisco Bay Area, including Marin, Sonoma, and Napa are Charcoal, Coastal Slate, Hickory, Sagewood, Sandalwood, and Stone Gray. Better for the environment . . . better for you! A cool roof helps minimize solar heat gain by reflecting incoming sun ray and re-emitting the absorbed energy, thereby reducing the heat going into the house and in the attic. This may translate into saving on air-conditioning bills. Installed by Wedge Roofing, a GAF Master Elite Contractor, your new Timberline HD Reflector Shingle Roof can qualify for GAF's top transferable warranty. Roof Installation areas include Marin County, Sonoma County, San Francisco, and Napa. Designed with Advanced® Protection Shingle Technology, which reduces the use of natural resources while providing excellent protection. Features GAF proprietary color blends and enhanced shadow effect for a genuine wood shake look. Highest Roofing Fire Rating ... UL Class A, listed to ANSI/UL 790. The savings from a cool roof is dependent upon various factors including, but not limited to, radiative properties of shingles installed, climate zone, utility rates, location, and HVAC equipment efficiency. For the radiative properties of cool roof rated shingles, please visit the Cool Roof Rating Council.